The Nano ZMS is a tiny devices that takes transcoded IPTV channels (from the Muxing Engine) and is capable of generating either 1 x Output using the HDMI feature or Multiple Outputs using the MPTS/RTP feature that is compatible with many Digital TV Headends in the market. The Nano ZMS also has the ZiFi Wireless Television feature that can "inject" your channels into an existing WiFi Network streaming directly to user devices through the browser. Once you have generated a MUX 2.5Mbit with our Cloud Muxing Engine which contains the IPTV stream of your choice, it is ready to be delivered to the Nano ZMS. Your content can then be enjoyed through the HDMI Output connector. When generating a MPTS MUX, you can use the Nano ZMS to obtain the content. The Nano ZMS will then send the MUX to your IPTV Digital Headend via the Network port. The Nano ZMS therefore will deliver the STPS / MPTS Mux directly to your IPTV Headend where you configure the rest of your settings. 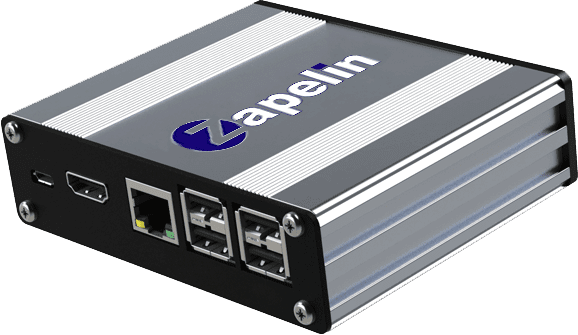 The Nano ZMS can also obtain the content you have placed inside the Muxing Engine and "inject" it into a local WiFi Network, enabling all connected devices with local streaming capabilities. ZiFi essentially turns every device into a portable TV that can enjoy streaming from anywhere on the WiFi network. *The Nano ZMS will ONLY work with our Muxing Engine. For every Nano ZMS a MUX 2.5Mbits (Muxing Engine) is required.